This week’s featured photograph from Creative Sparks comes from photographer Lee Chestnut. Lee has been working along several paths recently. Some of his work explores witty or unexpected juxtapositions, in other work he combines multiple photographs in Photoshop to create entirely new compositions and along a third path Lee explores the pure joy of seeing. The textures and lines of this deceptively simple photograph draw me in and invite me to explore the image. As I do I notice a confusion of space as the white lines lead me back into a perceived 3rd dimension. This depth perception is counterbalanced by the texture of the pavement which appears as a flat, 2-dimensional surface. 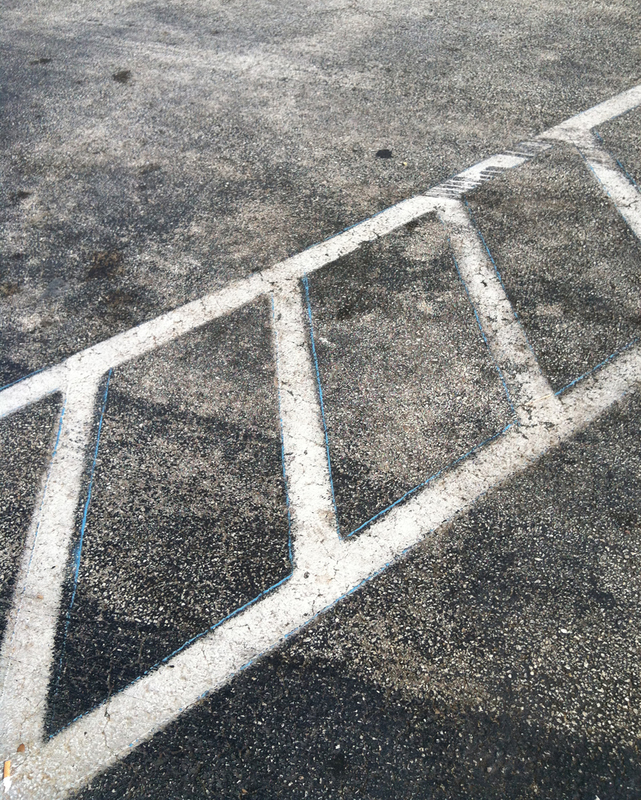 I also notice that the white lines suggest a 3-dimensional structure resembling a ladder lying in the ground. I really enjoy the simplicity and sense of spontaneity of this image. The textures, sense of light and confusion of space give me a lot to look at as I explore it in detail. Thanks Lee! Photograph © Lee Chestnut. All rights reserved. Used by permission.